One day while cleaning his room I found the extra pillow case wedged far beneath his bed. 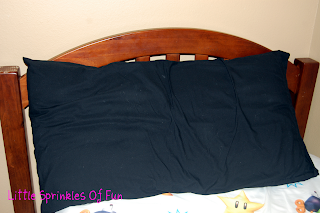 I wondered what I could do with this extra black pillow case. I had yet to put up any kind of window treatment to match his new bedding. 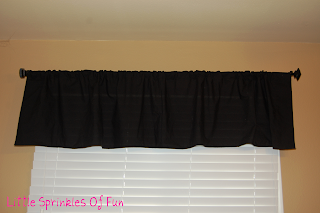 I figured I could at least throw a valance together using the extra pillowcase. Basically, all I did was take out the stitches out of the one side. The other side I just cut straight across. That left me with one long panel. I hemmed each side. At the top I made a bigger hem all the way across to insert the curtain rod into. It turned out great! 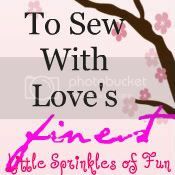 I love fast and simple projects like this one!